A student’s aversion to the library doesn’t always stem from their inability to find what they’re looking for within your building. Instead, many of them struggle with understanding how to utilize everything the library has to offer in general. 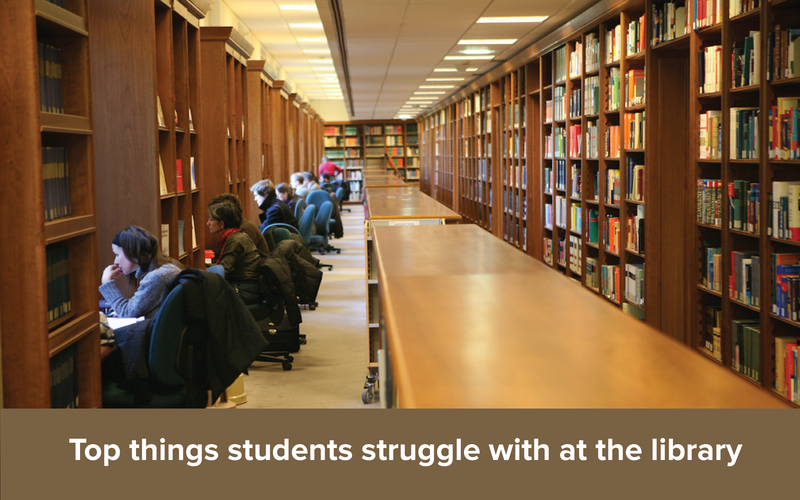 Today, we’re looking at the top struggles students have with libraries and providing you with some ideas to fix them. For some students, research-based projects and papers fill them with an overwhelming sense of dread—and they’re not alone. According to a study done by Project Information Literacy in 2010, 84 percent of the over 8,000 college student respondents said that getting started on research projects is the most difficult step in the process. The study also showed that students continue to struggle with the research process throughout project creation—finding it difficult to sort through resources and decide what information should and should not be used. Knowing that students struggle with understanding how to research and where to even begin, it’s important for the library to step in and help change this trend. Make the process feel less intense by offering research 101 workshops and seminars to help students become more comfortable with your library. In these sessions, you can explain how students can break down the research process into manageable bits, find sources that will enrich their classroom learning and sort information into what’s usable and what doesn’t fit. Most college libraries are spread out over thousands of square feet and multiple floors — sometimes even across different buildings. With so much space to canvas, students searching for An Introduction To The History of Western Europe might feel a bit overwhelmed trying to navigate the library space. And if they’re on the lookout for an electronic resource, they might have an even more difficult time, especially if they’re unfamiliar with using online journals and databases. Keep in mind that students aren’t as familiar with the library layout and location of most of the resources as you and your staff are. Students may be hesitant to utilize all your library has to offer because they’ve struggled with locating books, study rooms and other resources in the past. Be sure to keep your help desk fully staffed and have librarians stationed around the library so students know friendly help is always close by. Let philosophy students give up on Heidegger’s Sein und Zeit because they can’t bear the existential drama of the book’s deconstructionalist philosophy—not because they can’t find it in the stacks. From understanding the basics of research to going out and locating the resources that will help them succeed, some students need a little extra help with understanding how to utilize the great offerings your library provides. Do you have awesome resources that need promoting? First, stop by Mango Market for free marketing tools to help you get the word out. Then, download our case study onBrazosport College’s awesome campaign to promote Mango around their campus.